Anyway, the girl working in the above-named shop showed us some fabulous studded shades, you know, the one-of-a-kind eyewear Rihanna couldn't get enough of. The kind of shades that give you confidence, sophistication and coolness at the same time. Very stylish and quirkily fashionable shades that would automatically earn you respect. So I googled the designer of these unique golden with spikes adorned shades... and who popped up? 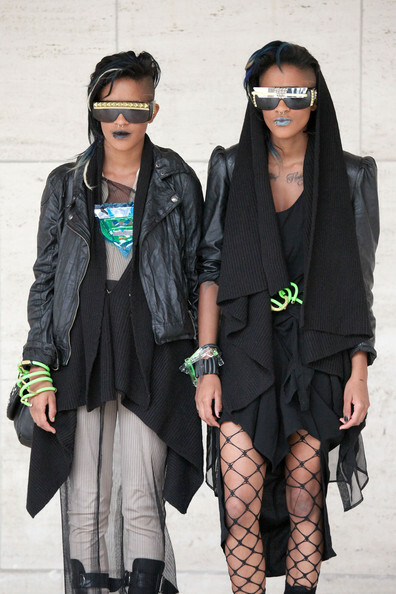 Two even more fashionable ladies called Coco and Breezy who happen to be both identical twin sisters AND insanely cool. Corianna ("Coco") and Brianna ("Breezy") Dotson founded their fashion accessory company in 2009 and took the fashion world by storm. From then on their pieces were worn by celebrities such as Nicki Minaj, Kelly Osbourne and Ashanti, and displayed in various fashion mags like Glamour, Nylon and Teen Vogue. 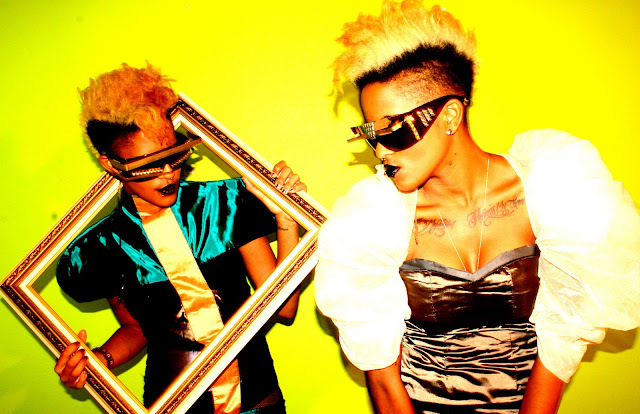 Eyewear is not the only thing Coco and Breezy have to offer though, the girls are true show-stoppers themselves. Just check out these pics I found, then you know why it's so easy to have a crush on them. Their unusual style, mixed with the statement pieces they wear, simply is one-of-a-kind. Coco and Breezy - I can only imagine what happens when these two powerful ladies with their signature style step on the scene! Enjoy the pics and check out their online store (click for shopping) and blog (click for inspiration). Haha, loved the line 'anything a swagger person desires'! So awesome that they're twins, share swagger style and design sunglasses! I wonder what you think of Iggy Azalea? I posted about her last month, she springs to mind when I think of swagger! Love this style - I don't know how well it would be received in Aus, but who doesn't want to push the fashion boundaries anyway?? Come have a look sometime? Wow they sure have some crazy things! They have so cool stuff!! Derbe DERBE cool! Da hätte ich mich locker in Grund und Boden geshoppt, ist genau mein Fall :) Nur die Boy London Sachen sind nicht so meins, die Marke hat mir nen zu zwielichtigen Ruf. Aber sonst - fresh to death! I love the glasses, they look so cool! das ist krass. echt krass. und geile bilder.